Please be mindful of the following carpool procedures in order to ensure the safety of every PRE student. Every child needs hugs, kisses, or high-5s to start the school day. Please take care of this before arriving in the drop-off zone each day. Students may begin exiting cars at 7:30am each morning when school employees come outside to greet and assist students. Only the right lane is for drop-off and pick-up. Merge into this lane as soon as you get to the yellow island. Remain in the right lane until you are at the front of the school and allow your child to enter and exit the car from the passenger side only. If you use the safety lock feature on your car, please remember to disable this feature when dropping off or picking up your student. 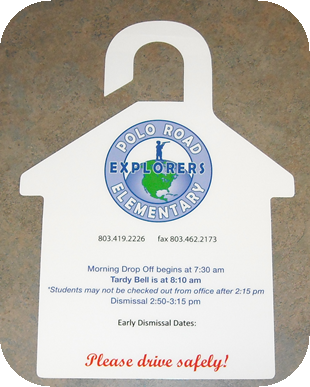 Remember to clearly display your child's car rider sign in the window of your vehicle during dismissal. This helps our staff know that the person in the vehicle is authorized to pick up the student and it helps to expedite the pick-up process. When a car does not have an official school sign, the driver will need to park and come into the front office (with ID) to obtain a sign, and then circle back into the carpool line. We appreciate your continued support with these reminders. We just want to do all that we can to ensure everyone's safety.